It’s been one year since an unhinged Arizonan killed several people in cold blood while attempting to assassinate Rep. Gabrielle Giffords. The BBC is silent on that matter today, which is slightly curious considering the big deal it was at the time, and what larger meaning they and their fellow travelers in the Left-wing US media tried to force onto it. They tried to blame Sarah Palin for inciting this act of mass murder. She had previously published a map with a cross-hairs on it, calling for supporters to “target” various Democrat opponents. 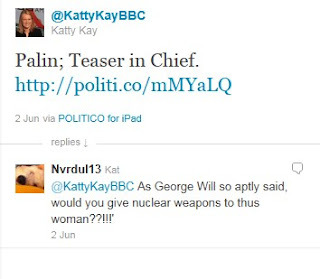 Ignoring all common sense and the fact that this was a common rhetorical gesture, nothing to do with a call for violence, the BBC pushed the idea that Palin was to blame. But now…silence. The easy “journalistic” defense is that the BBC has only such much time and only so much room to do stories, and the Republican race, the economy, and foreign policy developments take up the bulk of their time. The rest of the 55 Beeboids employed to cover the US are dedicated to producing more lightweight, magazine-style pieces and celebrity gossip, so hard news is outside their bailiwick. Call it a straw man if you will, but then please give me an alternative reason for the BBC’s silence. My bet is that the agenda the BBC tried to push at the time has proved to be false, so they’ve ignored the story since there’s no special issue mileage to be gained. Also, if they bring it up again, they have to be careful not to remind you of their behavior at the time. Let’s recall how the BBC, following the lead of their like-thinking brethren in the US media, tried to tell you that this act of mass murder was partially Sarah Palin’s fault. Let’s also recall how they pimped the President’s ill-advised attempt to use this tragedy to push His anti-gun agenda. 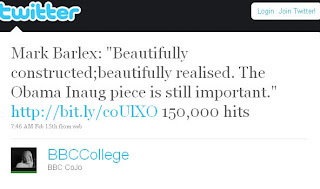 The tweet has since been deleted. 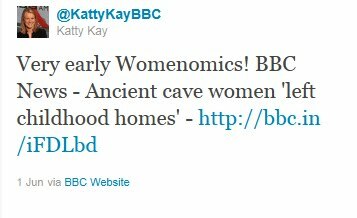 Down the memory hole, like so many other unfortunate tweets by BBC employees after they’re caught out. 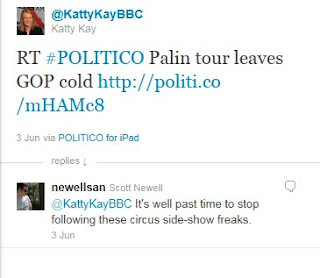 As DB noted at the time, Katie Connolly (who later left the BBC to work for a Democrat strategy group) tried to smear the Tea Party movement with this by tweeting that the entire movement was Giffords’ enemy. Gavin Esler and a stalwart of the BBC College of Journalism were just two of the other BBC employees who joined in the fun. The BBC’s top man in the US, Mark Mardell, also tried to smear Palin and the “rhetoric” of the Right for this tragedy. Sure, he opened with the “we don’t know the motives” disclaimer, but his entire post is dedicated to pointing the finger of blame. As I said in a post following the incident, this was drastically different from his behavior when Maj. Nadal murdered several people in the name of Islamic jihad. Mardell further pushed his Narrative that Republicans engage in dangerous behavior in a later post, in which he promoted a speech by the President. The President also ran with the sick Narrative that Right-wing political rhetoric was to blame for the incident, and did a “we must all work together” speech. It became apparent almost immediately to those who looked somewhere other than the BBC and the Huffington Post for their news on US issues that the mass murderer was mentally ill, and that partisan politics had precious little to do with his actions. The BBC took days to admit this, and not a single Beeboid apologized for their biased, inaccurate, slanderous statements. Today, the BBC is silent. If they do whip up a news brief about it for tomorrow morning, they won’t be reminding you of their disgusting behavior at the time, won’t be reminding you of how their fellow travelers got it horribly wrong, won’t want you to recall how this tragic act was used to advance a political agenda. UPDATE: The news brief is up. As predicted, no mention at all of the media hysteria, hoping you won’t remember the BBC’s disgusting behavior. One would have thought this would be a good moment to think about the dangers of divisive rhetoric, but then it’s only the Left doing it on this issue, so the BBC won’t touch it. Kudos for pointing it out, Iain, but given the BBC’s record I’ve got to say that’s quite a pair of balls you’ve got there. Smug metrosexual leftist elitists hate Sarah Palin. The prospect of her standing for the Presidency and even, gosh, WINNING it, induces a cold sweat amongst BBC types. So, it’s important to ensure she never gets an even break, Cue interview with David Frum, former Bush speechwriter, (a decent guy who I have corresponded with) but who is an on-the-record Palin hater…here’s Frum from last year. We are afraid that it is not utterly inconceivable that she could win the Republican presidential nomination in 2012, and we are afraid that if she did so she would lead the party to a 1964-style debacle, accompanied by unnecessary losses down the ballot. David is entitled to his view but why not provide time for someone who believes that Palin is a force for good and a genuine star in the US political constellation? No, get a Beltway elitist on who will say what you want. The BBC use talking heads who say what is expected. BBC’s Kevin Connolly covers the Sarah Palin book tour on Today this morning. (7.24AM) I thought it was a pretty fair although I smiled at Kevin accepting he is seen as part of the liberal elite media. Quite so. Christopher Hitchens has had two fairly well publicised articles out during the past week. The first, from Newsweek, attacked Sarah Palin; the second more recent piece appeared in Slate and attacked “the host of damage-control commentators” who rushed to claim that religion was not a motivating factor in the Fort Hood killings. No prizes for guessing which topic Hitchens was invited on the Today programme to discuss just before 7 this morning. Also, no surprise that Hitchens – well-known for his anti-Palin views – was the only person interviewed. I very much doubt that it even crossed the minds of the Today editors to seek the perspective of a commentator with a more sympathetic opinion of Palin. In the highly unlikely event that Hitchens had been asked on to discuss Fort Hood, I thinks it’s a near certainty that an opposing voice would’ve been heard. It’s funny but when Sarah Palin brought up the great dangers posed by Obamacare, using the term “death panels” to vividly describe possible outcomes, the BBC were quick to get stuck into her. Then, oddly enough, Today covers an item @ 7.45am (no link at time of writing this) in which a group of senior doctors who care for the terminally ill have written a letter in the Telegraph warning that some patients are dying prematurely because of new NHS guidelines in England. It seems to me that our own socialised healthcare system is all the warning the US needs, as Dan Hannan properly observed.